Audio Book Review: Top Game Story Crafting and Delivery! Uri Eden, the name he choose to go by to retain some defense against abuse, wakes up for the second time in his short twenty years from Cryo Sleep. His existence has spanned nearly a hundred and sixty years from what the Solar System has dubbed the Heroic Era, derisively. 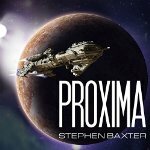 He wakes up on a kernel driven starship during the first half of the ship’s trek to Proxima Centauri, Nearest star to Sol. He is one of near two hundred undesirables swept up by Peace Keepers to form the first Sydney like colony on a world in another star system. This is so little of what is contained in this work you can be assured you have not had it spoiled. Some other ingredients range from AI’s, tri-pod alien life, Earth as a two power entity and much more. Baxter is an excellent world builder who hits all the important details including how people handle change. Narration was outstanding in vocal range appropriate to each of the characters giving you more than just the words to form a mind picture of each. Great job. I’m hooked. Already listening to the sequel, Ultima. Awarding the rare five out of five entertainment units some call stars. Enjoy!